Hello friends! It’s been a while. This school year has been a whirlwind to say the least. I am so blessed to be in a new school this year, small catch though... our first grade classrooms were not ready until the 7TH WEEK OF SCHOOL!! Oh..my...word. For the first six weeks of school, our librarian graciously shared part of her library space with me. The library is absolutely BEAUTIFUL!! One small problem though, the space we occupied had one wall of floor to ceiling windows! Needless to say, we spent many days discussing weather patterns and learning how different construction equipment/teams worked, lol. Let me just say, what doesn’t kill you makes you stronger... or at least it makes you appreciate your classroom! Anyway, we are now happily settled into our new room and loving it. I can’t say that I am fully unpacked, but all of my boxes are very well hidden. If there is one thing I really love, it’s organization. Moving into any new space definitely presents you with organizational challenges. It took me a few weeks to get my small group area right, but now that it’s ready, I couldn’t wait to share! The best part, once I started looking at everything, all but one of my small group bins/baskets were bought for $1 or less! When I moved, I found TONS of these little clear boxes that I had bought at Dollar Tree (3 for $1). In my old room, I had a basket for pencils, a basket for erasers, etc. This year, I made a small supply box for each student that would be at my small group table. Inside the box I put crayons, a pencil, an eraser and a spacing stick (popsicle stick). 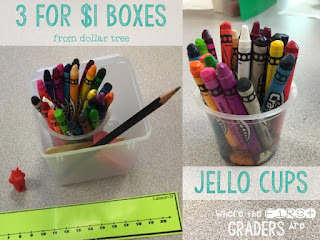 The crayons are inside a recycled Jello pudding cup, which is the perfect size/height for crayons! I will occasionally put a highlighter or dry erase marker in the box, but for the most part the students have everything they need with just those basic four items and I’m not having to pass things out each day. I’ve even started training my first table group to go get their box off the shelf, and the last group puts them up! 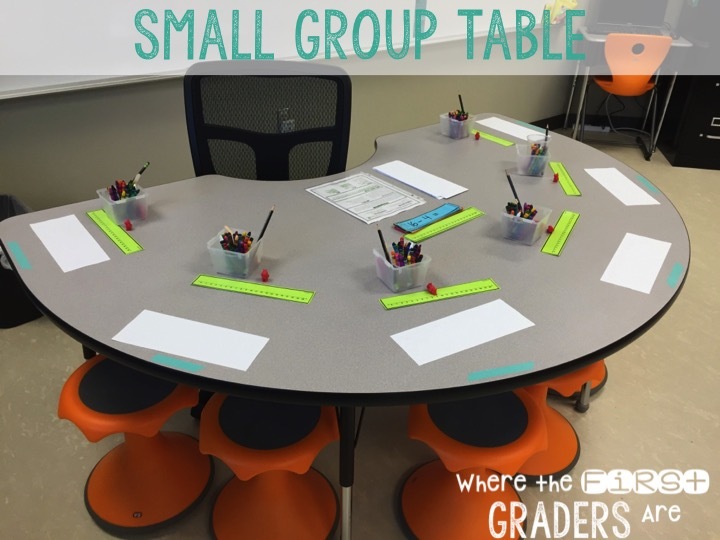 Teacher Tip: Do you have chairs or stools that seem to migrate their way around the table? 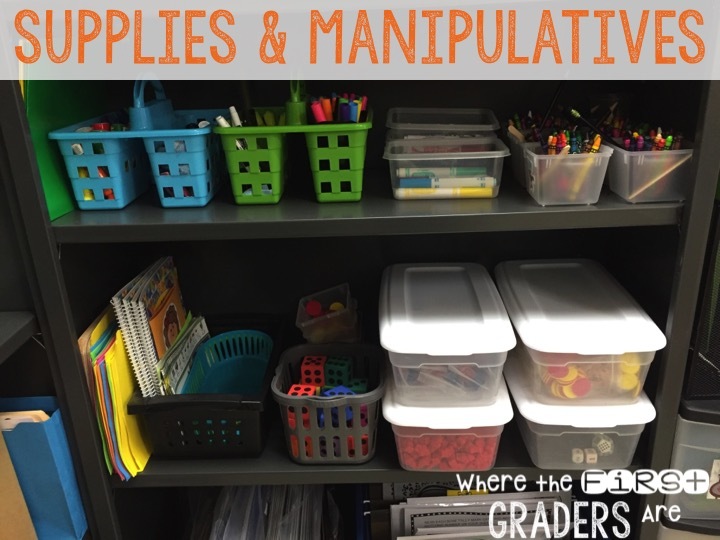 Use washi tape to mark where the students should sit. 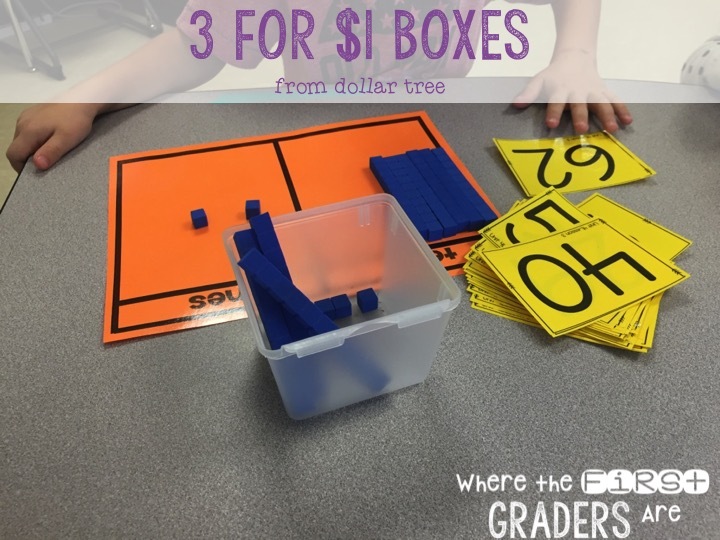 Yep, there are those cute little 3 for $1 boxes again! They are also great for holding math manipulatives. I prefer these boxes over the Ziploc bags that they come in because the students are able to get started and clean up much faster! When you only have a limited amount of time in your small group, you don’t want to waste a second! 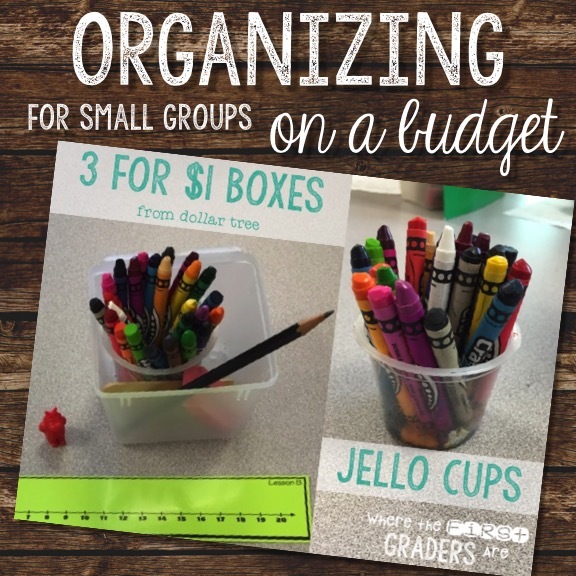 To pin this organizing tip and see many more---> Follow Where The First Graders Are's board DIY, Organizing and Decorating for a K-2 Classroom on Pinterest. 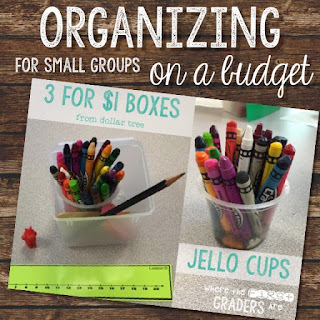 What "on a budget" organizing tips do you have? Share in the comments below!